Spring is here and it's all about colour and fragrance. In our part of the world, the two flowering plants competing for the Scent of Spring are probably jasmine and citrus. Both are delightful, easy to grow and are almost guaranteed to be in bloom on the first day of spring and for many weeks after. There is another plant, though, that I think rivals these for spring fragrance, although it can be mighty hard to find. 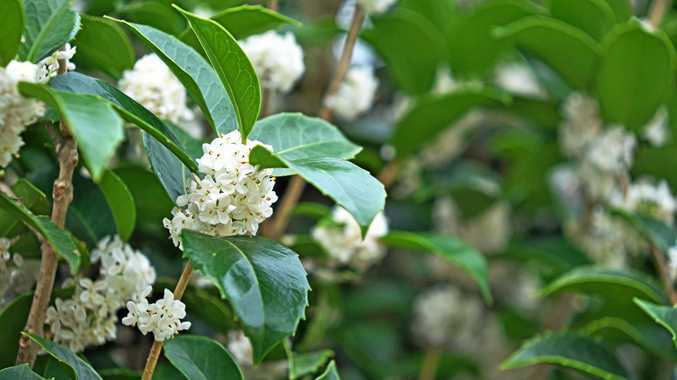 I'm talking about osmanthus fragrans, known sometimes by a variety of common names including sweet olive and tea olive. This is a very hardy, slow-growing shrub that is native to parts of Asia, including China and Japan. It has holly-shaped leaves and clusters of heavily perfumed flowers along the branches. Though the flowers are very small and not terribly showy, they are rather pretty and the fragrance is deliciously sweet and utterly delightful. Osmanthus fragrans is said to have a fruity aroma, reminiscent of peach and apricots, rather than a classic "floral" fragrance. It is fresh and sweet and, though strong, not at all over-powering or cloying. This somewhat old-fashioned shrub is very easy to grow in a sunny or partly shaded position. It will grow to about 3m or possibly more in ideal conditions. Thanks to its quite narrow, upright habit, it is a great choice for a small garden. Because it is quite slow-growing, it is well-suited to pot culture. Do bear in mind, though, that it will not necessarily be a showy specimen, although it will smell divine for a couple of months every year. Of course, use a premium potting mix and fertilise regularly.